Air Arabia is a budget airline based in the United Arab Emirates. It operates scheduled services to 32 destinations in the Middle East, North Africa, the Indian Subcontinent and Central Asia. Its main base is Sharjah International Airport (SHJ). The airline started operations in October of 2003. Budget airline Air Arabia has begun service to the southwestern city of Ufa, Russia. This is the UAE-based airline’s third destination in Russia, following Moscow and Yekaterinburg. The initial schedule will be 2 flights per week on Tuesdays and Fridays. Flights will depart Sharjah International Airport at 6:55pm and arrive in Ufa at 01:55am local time. Return flights will depart Ufa International Airport at 02:55am and arrive in Sharjah at 05:55am local time. Air Arabia has announced it will offer direct flights from its base in Sharjah, UAE to Odessa, Ukraine starting October 12, 2012. This will be the low-cost airline’s 76th destination and its 4th in Ukraine. The initial schedule will be two round-trip flights per week on Tuesdays and Fridays. The outbound flight will depart Sharjah International Airport at 9:25am and arrive at Odessa International Airport at 12:40pm. The return flight till depart Odessa at 1:40pm and arrive in Sharjah at 8:20pm local time. 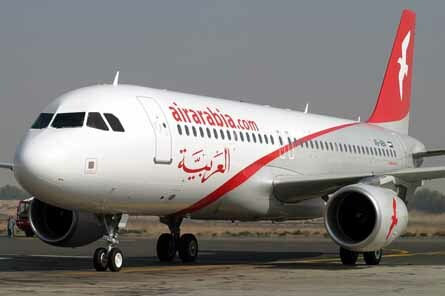 Air Arabia has announced it will soon offer direct flights from Sharjah, UAE to Taif, Saudi Arabia. The low-cost airline will launch the new route on June 2, 2012, and offer three round-trip flights per week. Flights between Sharjah and Taif will be available on Sundays, Wednesdays, and Fridays. Out-bound flights will depart Sharjah International Airport at 12:15pm, arriving at Taif Airport at 2:05pm. Return flights will depart Taif Airport at 2:45pm, arriving in Sharjah at 6:30pm. On Monday, January 9, 2012, low-cost carrier Air Arabia announced the expansion of services to Moscow from its hub in Sharjah. The budget airline will increase service to five flights per week, an addition of two flights to the schedule first launched in October 2011. Direct flights to Moscow now operate on Tuesdays, Wednesday, Fridays, Saturdays and Sundays. “We are extremely pleased to announce the expansion of service between Sharjah and Moscow, which will further enhance travel options for the residents of both cities,” said AK Nizar, head of commercial department, Air Arabia. Air Arabia, a budget airline based in the UAE, was presented with the prestigious award for best low cost carrier – International at the Travel Agents Association of India Diamond Jubilee Celebration and TAAI Travel Award 2011 held at Taj Land’s End, Mumbai. The award was handed over by Subhodkant Sahay, Union Minister of Tourism and Iqbal Mulla, President of TAAI in the presence of over 800 Travel agents. Adel Ali, Group Chief Executive Officer of Air Arabia said, “We at Air Arabia are extremely elated to have won this award particularly for it coming from our fellow partner Travel Agents Association of India. This recognizes our efforts in offering the best while continuing to offer value for money to all our stakeholders”. Air Arabia completed its six years of operations in India and currently operates flights from its hub in Sharjah to 13 Indian cities, which include Jaipur, Kochi, Nagpur, Coimbatore, Thiruvananthapuram, Goa, Kozhikode, Hyderabad, New Delhi, Mumbai, Bangalore, Ahmedabad, and Chennai. Air Arabia has a fleet of new Airbus A320s. From its three main hubs, Sharjah in the UAE, Casablanca in Morocco and Alexandria in Egypt, the carrier serves a network of some 70 international routes spread across Europe, the Middle East, the Indian Subcontinent, Central Asia and North Africa. Air Arabia will introduce direct service to Moscow and Yekaterinburg in Russia, beginning October 14 and 29 respectively. The two new Air Arabia destinations are the first in Russia. Moscow and Yekaterinburg will become the carrier’s fifth and sixth destination in CIS and Russian Federation and its 69th worldwide. Air Arabia will offer service to Moscow on Tuesdays, Fridays and Sunday, departing from Sharjah International Airport at 09:00AM and arriving at Moscow Domodedova Airport at 14:00PM. Return flights will depart from Moscow on the same days at 15:00PM and arrive in Sharjah at 20:00PM. The carrier will offer service to Yekaterinburg on Wednesday and Saturday departing from Sharjah International Airport at 10:05AM and arriving at Yekaterinburg Airport at 16:50PM. Return flights will depart from Yekaterinburg on the same days at 17:50PM and arrive in Sharjah at 20:50PM. Moscow, with a population in excess of 10.5 million, is the most populous city in Russia, the largest nation on earth, and is the country’s economic and political centre. The UAE is home to an increasingly significant Russian expatriate community, and is also one of the preferred holiday destinations for residents of the country. Air Arabia ‘Egypt,’ an Alexandria-based Air Arabia Group company and Egypt’s new low cost carrier (LCC) held an official ceremony today in Cairo to mark the carrier’s launch. The event was attended by officials from Egypt and UAE along with members of public and trade sector. Based at Burj Al Arab International Airport in Alexandria, Air Arabia ‘Egypt’ first commercial flight took off the skies on June 1st , 2010 to Khartoum, to be followed by flights to Kuwait , Amman and Beirut..
A joint venture between Air Arabia, the first and largest low-cost carrier in the Middle East and North Africa, and the Travco Group, the Middle East’s largest travel and hospitality group, Air Arabia ‘Egypt’ will shortly plans to expand further its range of destinations from Alexandria Burj Al Arab Airport to key cities across the Europe, Middle East and Africa (EMEA) region. Adel Ali, Group Chief Executive Officer of Air Arabia said: “We are extremely pleased to announce the launch of operations of Air Arabia ‘Egypt,’ the newest member of the rapidly growing Air Arabia family of companies. Complementing our existing operations in the United Arab Emirates and Morocco, this new low-cost carrier will provide the same consistently high level of service, operational reliability and value-for-money fares that have become the hallmark of Air Arabia. We thank the Egyptian Civil Aviation Authority and the management of Burj Al Arab International Airport as well as all our strategic partners for marking the launch of Air Arabia ‘Egypt’”. “Today represents a milestone in the history of the travel and hospitality industry here in Egypt – and for all of us at the Travco Group and Air Arabia,” said Hamed El Chiaty, Chairman and CEO of the Travco Group. “For more than three decades, we have focused on fostering the development of an umbrella of brands that contribute to the diversification of the domestic tourism industry, which is so vital to the Egyptian economy. Building upon Air Arabia’s existing service to 60 destinations across Europe, the Middle East, Africa and Asia, Air Arabia ‘Egypt’ is now contributing to the ongoing development of the Egyptian travel and tourism sector, while also offering a larger base of customers the best value-for-money air travel options. Air Arabia announced today that it will begin service to the Indian city of Bangalore on October 15. The flights will initially operate four times per week between Bangalore and Air Arabia’s hub in Sharjah, and then from October 29, flights will be daily. Flights to Bangalore will leave Sharjah at 22:50PM local time and arrive in Bangalore at 04:20AM local time. Return flights will leave Bangalore at 05:05AM local time and arrive in Sharjah at 07:50AM local time. Bangalore is Air Arabia’s ninth destination in India, and increases Air Arabia’s total destinations to 37, a destination network that stretches from Eastern Europe, through the Middle East and North Africa, to South Asia. Bangalore is India’s third most populous city and a major economic hub for the country. With its addition to Air Arabia’s 11 other destinations in South Asia, Air Arabia has become one of the leading LCCs serving this growing region.